Five years! That's how long it has been since Sam and Fuzzy updated for the very first time. And that makes this the fifth time I've had to write a newspost about the comic's anniversary... which probably explains why I'm having trouble thinking of something to say that I didn't already mention one of the last four times. I guess five years is a pretty long time to spend doing almost anything! But honestly, it's not something I think about much. 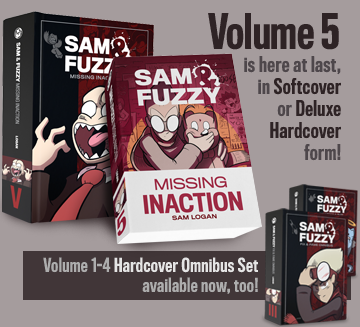 I like drawing Sam and Fuzzy comics. It's practically an addiction. 700-plus strips isn't an accomplishment, it's a symptom. Anyhow, happy anniversary to me! And thanks to all of you folks for reading my work, sending me nice comments and buying my wares. The thrill of having you all here has yet to wear off. Poster pre-orders wrap up on Sunday. Any orders I get now will help take a chunk out of the printing bill, so if you were planning on buying one and are able to do so now, you have my extreme gratitude and lovingly intangible internet hugs. I am really digging the sounds of Battles (the band, not the phenomenon). If you are ready to hear some really keen intricately-layered rock stylings, the band is sharing an extremely generous amount of their music on their MySpace page. Listen, and imagine a time when people actually had to buy albums without previewing them beforehand! The second batch of posters will be going to press next week. 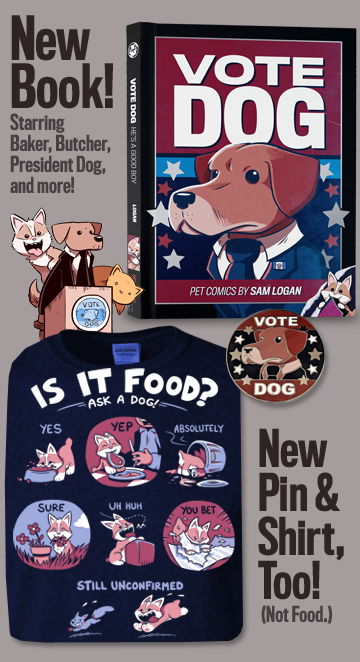 If you're looking to get one and are able to place your order before Monday, it's much appreciated -- pre-orders help me cover the printing cost and gauge how many I'm going to need for the future.